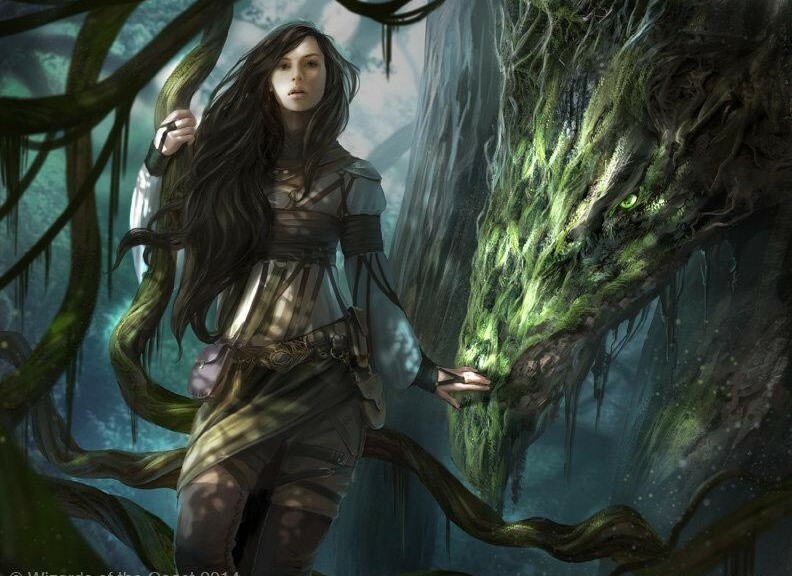 Hangarback Walker, Whisperwood Elemental, Tasigur, the Golden Fang, Evolutionary Leap, Warden of the First Tree, Llanowar Wastes. These are the latest cards of value to be put into an Event Deck, and the latest to take a hit straight to the value as a result. In some cases, there was an immediate loss of value as people panic-sold and stores changed their listed prices, for the buying and the selling of the card. However, I’m here to make the case that being reprinted this way is not as awful as you might think, and actually represents an opportunity. Let’s start with the precedent and the flag bearer for preconstructed deck inclusions: Umezawa’s Jitte. For the longest time, before the price graph shows, this was rock-steady at $20. During its time in Standard, Extended, and after that in Legacy, this has been one of the best equipment ever. (I’ll listen if you want to talk about the Swords or Batterskull, but really, this would get my vote.) Why was such a good card only $20? The preconstructed deck Rats’ Nest. 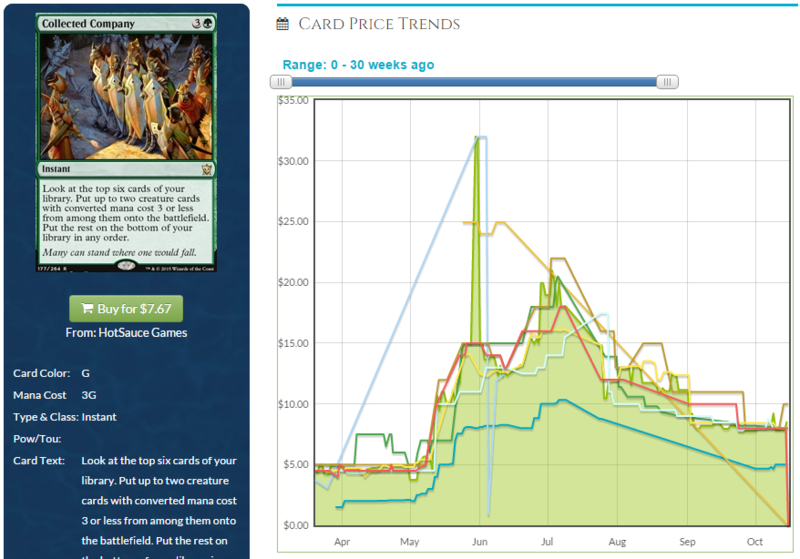 Simply having the card available in a $20 precon meant that there was a price ceiling, even as there was a very small chance of finding it at that price. Even now, with a Grand Prix promo out there, it’s got a relatively low price for a card this old and this good, due to price memory from being in the deck. This principle applies in the modern day: being in the Event Deck lowers the price briefly but can’t add too much quantity. How about an example of Wizards trying, I mean REALLY trying, to make a card accessible through Event Deck printings? Thragtusk was a lowly Core Set rare. Granted, that was Magic 2013, presumed to be a smaller print run than Magic Origins, and that was also before a lot of current players started, but it was THE card to have against blue decks. Or aggressive decks. Or removal-heavy decks. Or anything, really. It’s value coming, going, and in between. Imagine Abzan or other Den Protector decks with this card! Wizards wanted everyone to have as many Thragtusks as they wanted. To this end, on top of the original supply, this was added to three Event decks in a row: M13, Return to Ravnica, and Gatecrash. For a card that was seeing heavy Standard play, that was the only way for the price to get down to what Wizards felt was a reasonable one. Look at the beginning of the chart and that $25 tag. It still took three additional printings to lower it to $5, and by then, rotation was imminent, which likely did more for lowering the price. 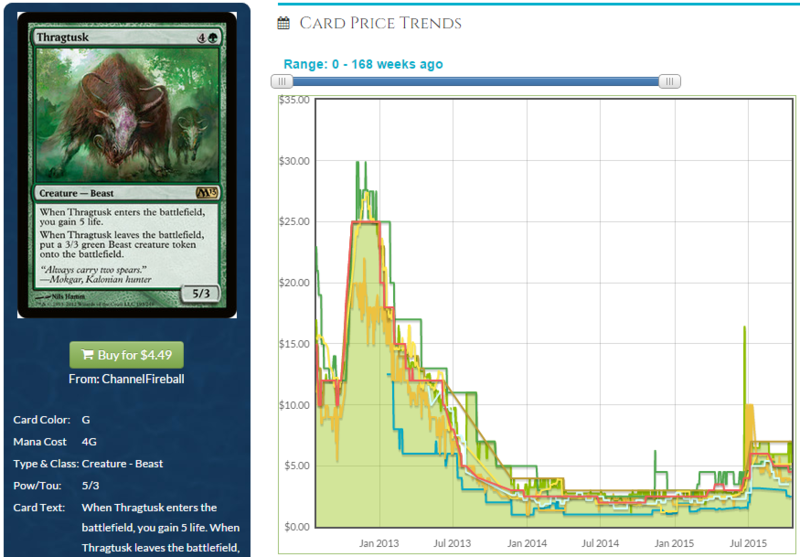 Thragtusk was at $25 and started going down immediately. It never stabilized because of the repeated printings during its year in Standard. Other cards have not gotten the same treatment. Let’s look at Godless Shrine. Notice that blip around June 2013? 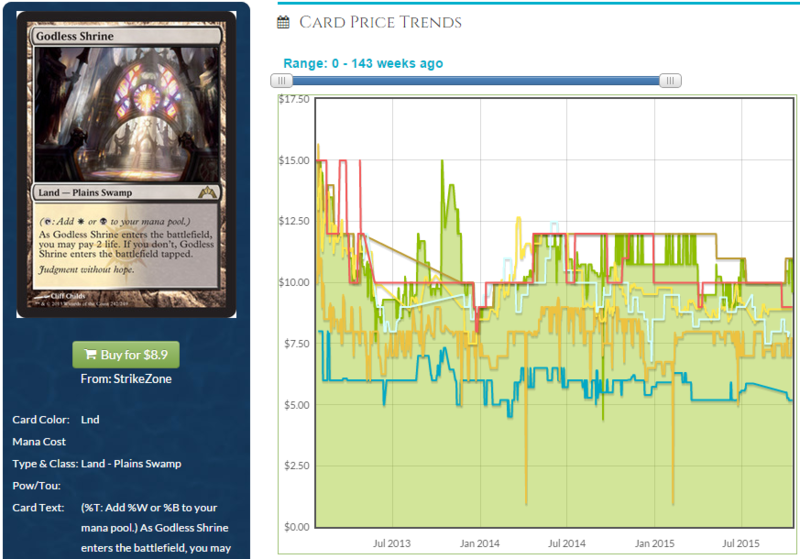 In early May, the Dragon’s Maze Event Deck was spoiled and there was one Godless Shrine in the deck, so it took a hit. The downward trend lasted for about a month, and then it ticked back upward. 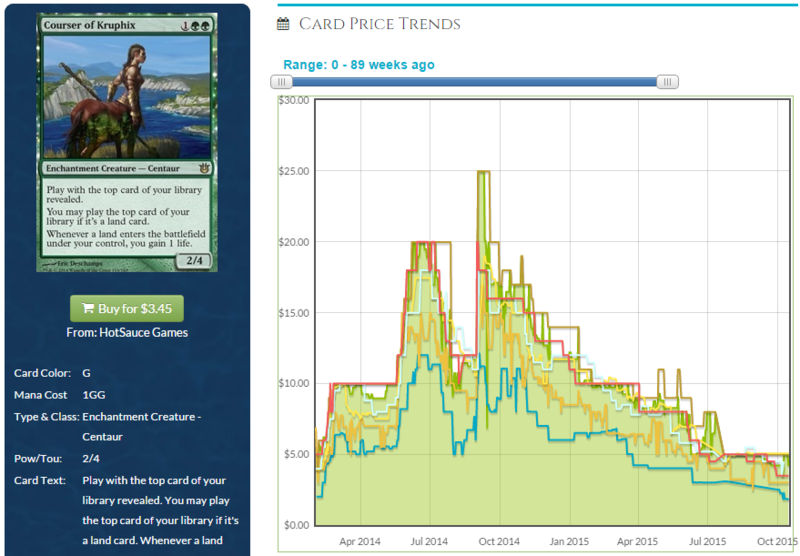 The card was good enough that while it didn’t rebound completely, it held much of its value. Same thing with Hallowed Fountain, a one-of in the Theros Event Deck. See that dip in the middle? Right before it made it to $25? That’s the Clash Pack copies hitting the market, and in the flood the price fell hard…and then came back by the time the new set was released. I’m not trying to make the statement that all the cards given an auxiliary printing will eventually regain their value. That’s not true at all, and there’s a long list of $5 or less rares that got reprinted and struggled to break $1 after the re-release. That’s likely the fate in store for Evolutionary Leap, Warden of the First Tree, and Llanowar Wastes. 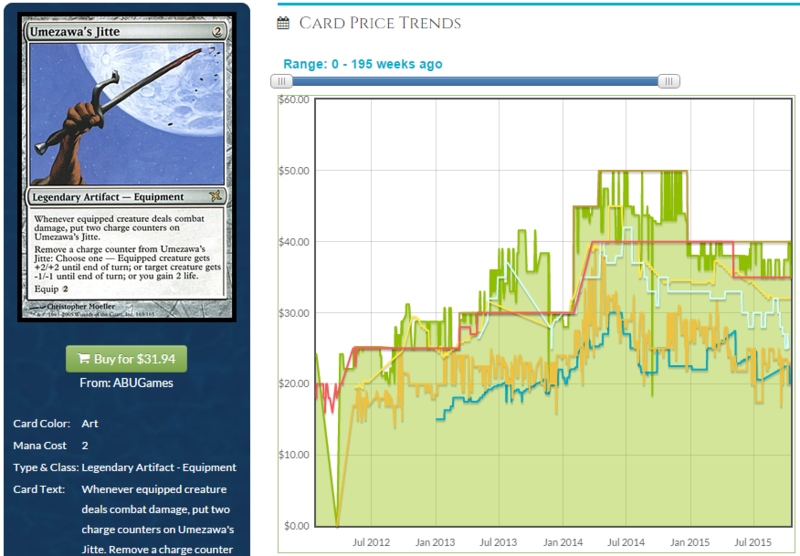 What I am saying is that the better cards, the already-expensive cards, those are very likely to bounce back. I’m specifically looking at Hangarback Walker, Tasigur, the Golden Fang, and Whisperwood Elemental. Hangarback has lost a couple of dollars in the last weeks since the announcement, and for a card seeing as much play as it is, that’s a very good sign for the card and our opportunity to gain value from it. I’m hoping that it goes down to $10 once the decks are on sale, because there’s still a whole year for it to go back up, and that doesn’t even count the appeal outside of Standard. The current dip means this is the time to buy in, even if it doesn’t go below $14. It’ll be $20 or more by Valentine’s Day, and that’s value we can use. Tasigur is in an interesting spot. Many of my peers here are preaching the foils, and I’m on board. I also think he’s good enough to hold a $10 price tag in a year when he rotates, because he’s big and easy to cast and has a great ability in older formats. It’s fascinating how on the day of announcement, he fell $2, but the demand is there. See that diagonal slide in July? The Clash Pack decklist was spoiled on July 9th of this year. We still have a lot of time for this to creep back up, especially because that particular card is already seeing Modern play in a variety of decks. So in closing, I want you to see reprints as opportunities. I’m still sitting on two playsets of Hangarback, and I’m giving serious consideration to a third.as the playset price creeps to $50 on eBay. If there’s other examples of cards resisting the reprint effect, list them in the comments! I used this summer’s CP to pick up more Windswepts around $9 per. What card art is used at the top of this article? Joe I’m pretty sure it’s a card in Origins and I’d look at green cards but I actually can’t remember which card the art is from. Goblin Guide was a 2 of in an Event Deck. Last year a writer mentioned that $60 for the event deck (maybe $40) was great value and the cheaper versions of the Deck were bought out shortly there after online. Oren-Rief Invoker from BFZ. I used google image search. Love that tool.